That is a neat thing to do with the boys.We don't have an elf just Hillary the spider and cold weather and Christmas just aren't her thing. I guess she is a Grinch come to think of it. Elves are better than spiders you did good. No more elf visits, as all my children are grown and have little ones of their own. The elves do visit them tho, and they have so much fun with them. NIce elf. He does have a sense of humor. Our elf, Peppermint, is usually a good elf as well. Occasionally, however, Peppermint does get into some minor mischief. Last year Peppermint drew (with dry erase marker) on our family photos. My 3 year old was so enraged that she had me to compose a VERY stern letter to the big man himself explaining what a bad elf he had been and questioning Santa's idea of sending such a naughty elf to her house. I about died laughing as I composed the letter, let me tell you. Since then, Peppermint's worst infraction was putting food coloring in the pancake batter. Your elf is crafty! Love the sign and the letter! At story time - I move wise men closer and closer to where we meet . . and share teeny bits of the story - adding extra songs as we get closer . . .
No elves but we do have a Jayhawk ornament that leaves notes to the Monkeys and candy if they behave. He moves around the tree nightly. I wish it was out when my kids were little - I think it is so much fun. We have an elf we got when the kids were tiny. They were afraid of it, because it kind of looks like Chuckie in an elf suit. My wife liked it and put it out every year on the mantle piece while the kids were home. I was kind of creeped out by him, myself. Now he is in the box of Christmas ornaments we never get out anymore. I love it that you have a 'nice' elf in your house setting a good example!!!!! LOVE IT..
We visit PetSmart quite a bit, what a cute idea. Ever since I heard of the elf, I have been so sorry we did not have the story back when our son was little. Our elf is a good example too. He just hides in different places. It's fun for our three year old to find him every morning. I love the way your are handling the elf. The kids at my school have wild and crazy elves. Cute! No wonder your kids have a sense of humor! I had never heard of this until you. My son would have loved this! The elf stuff that people do cracks me up! I enjoying seeing the different things people come up with to do with their elves. When I was a kid my mom actually did a few things with an elf that she had. She would say that he was watching us and reporting to Santa. Boy did I believe that! lol I think I have the original elf in a box in the attic. I hope to find it this year if my husband will continue to bring down the boxes from the attic! lol I do have an newer but older than the elf on the shelf elf that is nice. I've not been doing anything with him although I'm thinking my son is wanting to see him do something so maybe I should. 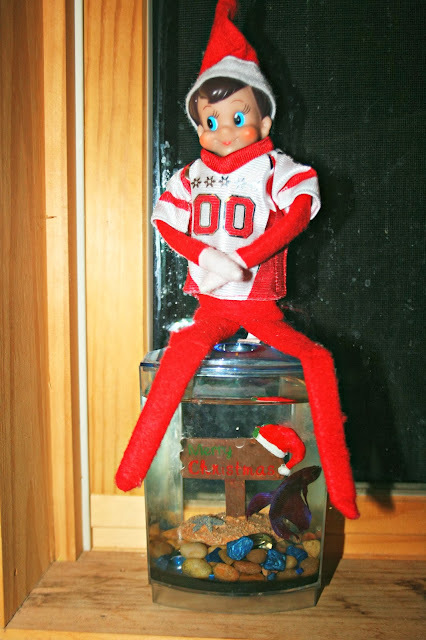 I think being a good Elf on the Shelf is awesome!